An often overlooked subject in the modern application of Feng Shui is the influence of buildings on health. Regardless of how you choose to achieve physical and emotional wellness, it is a universal aspiration that affects us all equally. Five Element theory which forms the foundation of Chinese Metaphysics, Traditional Chinese Medicine and Feng Shui, assigns the area of a building, community or organization with the greatest impact on health to the center or Tai Ch’i. This sector is associated with the stable Earth element, tethering the other four (Water, Wood, Fire and Metal) elements to each other like the spoke of a wheel. When in balance, Earth energy transforms, grounds and unites people by providing fertile soil to establish roots and safely grow where they are planted. One of the first things I assess in a client’s home or office building is how the tai ch’i is configured. Anomalies in architecture or design often predict problems down the road that can and should be averted. The center should be free of obstacles and accessible to all the other areas of the building via open spaces and wide gathering areas. Heavy furniture, angled walls, blocked doors and low ceilings can negatively influence health by disrupting the flow of energy necessary for healthy transitions. Stoves, fireplaces, bathrooms, elevators and utility rooms in the center are among the features that might scorch or erode health over time. A cluttered center can lead to stagnation, the source of many physical blockages and diseases. Noisy or chaotic centers lack balance, permanence and a sense of security. Like the human body, the physical vitality of an organization or a family is the result of healthy, flowing organ systems, so best to leave open space in the center. While many aspects of life seem beyond control, we can influence our surroundings and by association our destiny in the buildings we occupy. 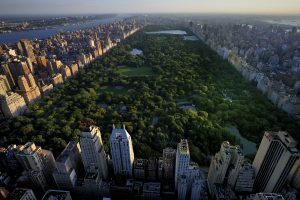 New York City’s Central Park is a perfect example of tai ch’i – a yin oasis and respite in the heart of a yang vibrant and diverse metropolis. The ideal of urban planners and Feng Shui consultants alike, it provides an excellent overview of how a cohesive center can balance and positively influence all its surrounding areas. Take a look at the center of your home or business if you’re feeling off to see if there is something that needs adjusting. And as always, let me know if I can help.